Help Esbern complete his research on dragons. Acquire a dragon bone and a dragon scale. Speak with Esbern once more to complete the quest. Once you have three followers recruited as Blades, you can ask Esbern for dragons to kill. Once you agree to kill one, Esbern will send you to a random place where you'll find a dragon. After you kill the dragon, you'll get the update to the quest stating "Return to Esbern". Return and speak to him; he'll ask for a dragon bone and a dragon scale. Give him the dragon bone and scale and he'll give you a potion. Drink the potion to gain the Dragon Infusion perk. Speak with him once more to complete the quest. The potion adds the permanent perk of 25% less melee damage from dragons. You do not gain the perk after drinking the potion and it is not obtainable via normal gameplay means. The quest journal entry won't update after quest completion. Workaround - Basically, you must not give the dragon's bone and scale to Esbern; use console commands instead. There are three contexts to consider, each with its own solution: the first one is before returning to Esbern, the second one is before turning-in the dragon's scale and bone asked by Esbern, and the third one is after getting the potion (after giving the dragon's scale and bone). Before returning to Esbern - You killed the dragon and got a new journal entry stating "Return to Esbern". Use the console to add the perk : player.addspell 000F5FFA. From then on, you won't be asked to retrieve a dragon's scale and bones and thus won't receive the resulting potion (it seems that one condition for triggering the quest is set by detecting that you don't have the perk yet). You can get Esbern's Potion quest line without recruiting any Blades. However, it will not be titled "Dragon Research" and is located in Miscellaneous Quests. 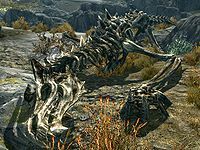 After completing Alduin's Wall (also may happen before you even visit Esbern), killing a dragon at a defined radiant location (such as a word wall) will trigger the objective "Return to Esbern". Speaking to Esbern then triggers "Give a Dragon Scale and a Dragon Bone to Esbern". When you give them to him, he will give you Esbern's Potion, but drinking it does not give you the perk. The perk portion of this bug is covered above and is fixed by an official patch. The following empty quest stages were omitted from the table: 100. On the PC, it is possible to use the console to advance through the quest by entering setstage FreeformSkyHavenTempleD stage, where stage is the number of the stage you wish to complete. It is not possible to un-complete (i.e. go back) quest stages, but it is possible to clear all stages of the quest using resetquest FreeformSkyHavenTempleD. This page was last modified on 27 September 2017, at 01:45.